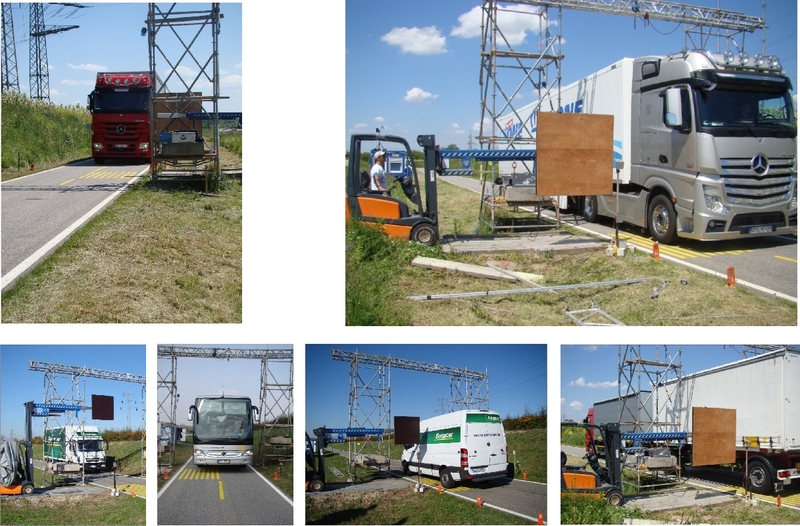 The data base VIPAS (Vehicle Induced Pressure And Suction) summarizes the results of extensive fullscale measurements, which have been performed within the DFG research project Ru-345/32-1. Die Datenbank VIPAS (Vehicle Induced Pressure And Suction) fasst die Ergebnisse zusammen, die im Rahmen des DFG Forschungsvorhabens Ru-345/32-1 in umfassenden Feldmessungen gewonnen werden konnten. Die Abbildungen, Skizzen, Zeichnungen und Fotos auf dieser und nachfolgend aufrufbaren Internetseiten unterliegen dem Urheberrecht. The pictures, sketches, drawings and photos on this and subsequent internet pages are copyright protected. Every day and innumerably, road vehicles of different types pass flat roadside-placed elements like stable or temporary traffic signs, noise barriers, charge devices, etc. The elements are exposed to a vehicle-specific flow and pressure field, i.e. to transient loads. 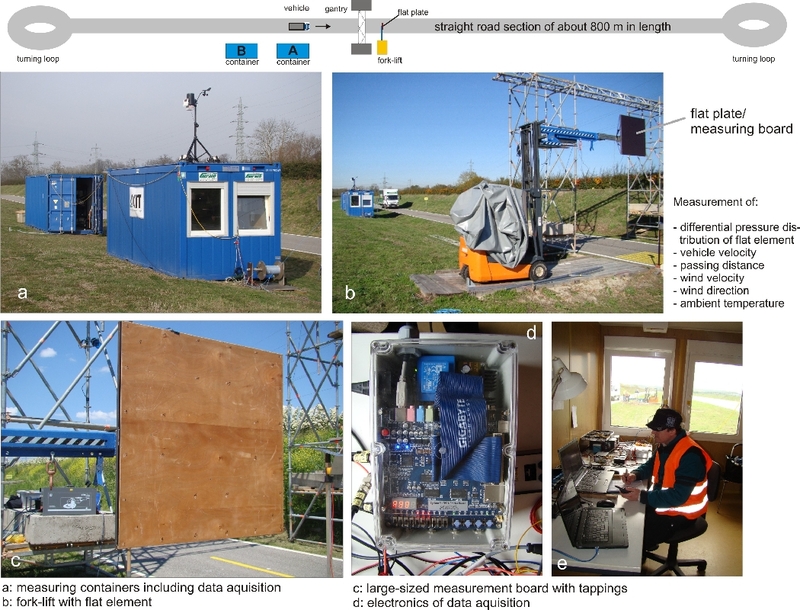 In order to quantify the involved phenomena, full-scale experiments were performed for six different vehicle types and three sizes of square plates, which were aligned in three different configurations with respect to the vehicle's track. For the measurement of loads effecting the plate, the pressure multi-tapping technique was implemented with high temporal and spatial resolution. 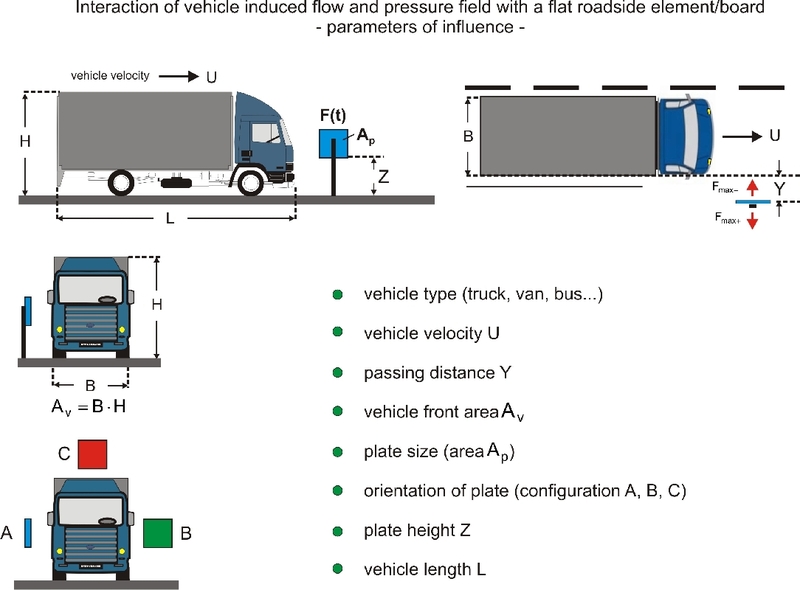 The experiments delivered a broad data-base for the proper quantification of vehicle induced loads on flat elements as a function of vehicle type, vehicle velocity and passing distance to the plate, element size as well as spatial plate alignment with respect to the vehicle. II How to imagine the flow field around a box-shaped vehicle ? 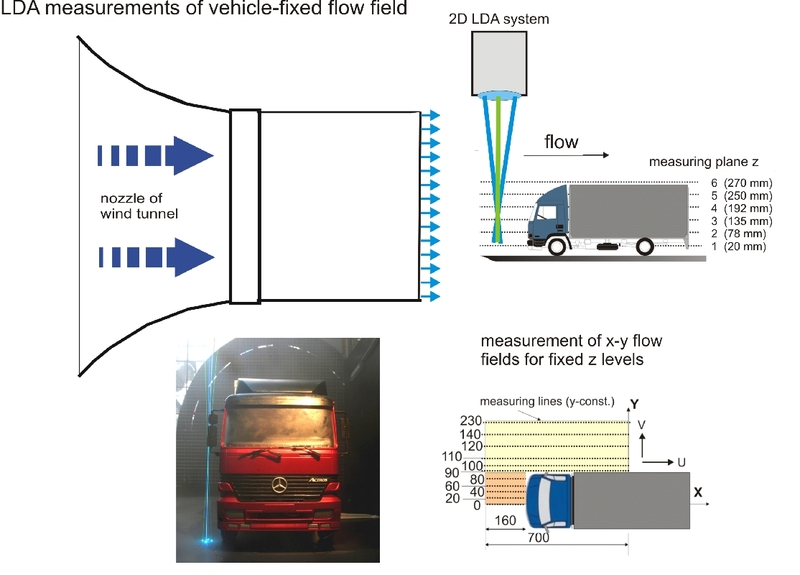 How to imagine the flow field around a box-shaped vehicle ? Fig. 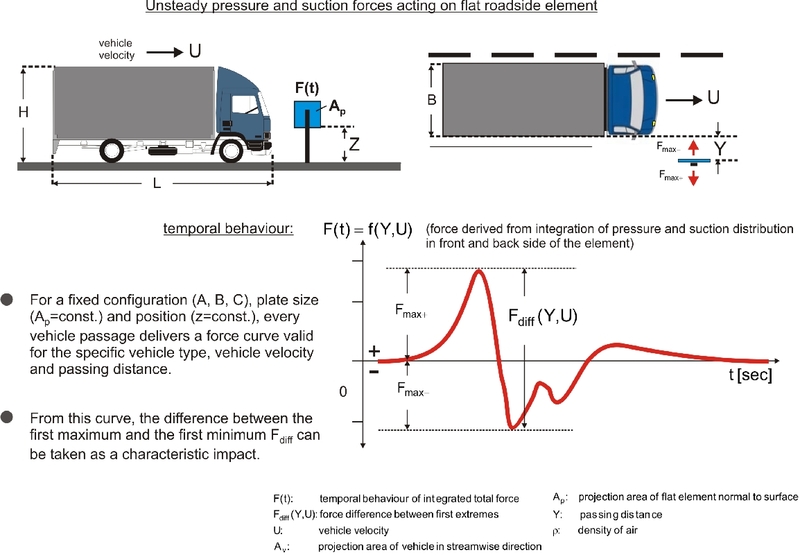 1: Characteristic force curves measured with truck and different configurations A, B, C; medium-sized plate; ensemble averaged curves, re-calculated for a passing distance of 0.7 m and an approach velocity of 80 km/h using the appropriate distance model as described below. Please note: A 'test position' is defined as a combination of one particular configuration (A, B, or C), one vehicle type, one vertical level Z of the test plate. 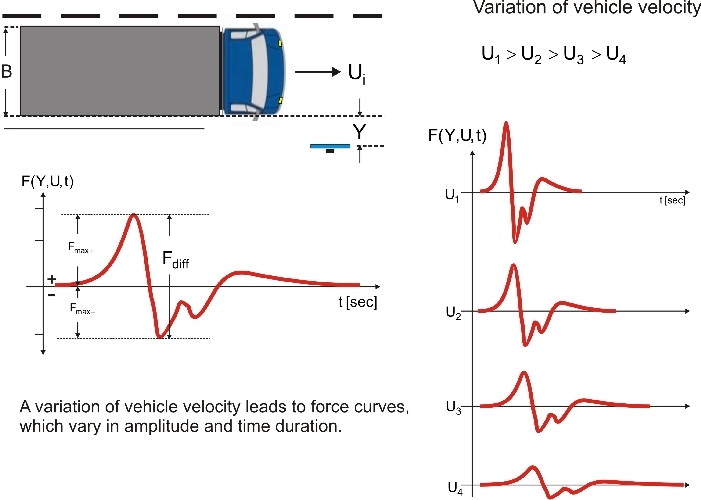 Since wind loads depend on the square of velocity, the vehicle-induced force F(t) was normalized by a force consisting of the product of vehicle velocity-based dynamic pressure, air density and the vehicle frontal area (Av = B x H). This led to the dimensionless transient force coefficient CF(t). Since the dimensionless transient force coefficient CF(tn) depends only on Y, it should be possible to divide it by a function k(Y), which is called 'distance model', forcing all curves collapsing to more or less one single curve, the 'characteristic load curve' for one test position, see below.. The distance model describes the relation between force impact and passing distance Y. In order to obtain a distance model, a great number of vehicle passings was realized with a specified test position measuring the differential force coefficient (difference of the force coefficient of the first maximum P1 and first minimum P3, see Fig. 1) in each curve and display the values in a graph. It was found that the differential force coefficient CF,diff13 could be approximated with a 3rd power function fitted within the tested distance range. Thus, for each test position, a distance model k(Y) was estimated applying model coefficients a [m3] and b [m] appropriately. The decay with power of -3 corresponds to a simplified theoretical model presented in Sanz-Andrés et al. 1992 (Sanz-Andrés, A., Laverón, A., Quinn, A., Vehicle induced loads on pedestrian barriers’, Journal of Wind Eng. & Ind. Aerodyn., 2003, 92, pp. 413-442). 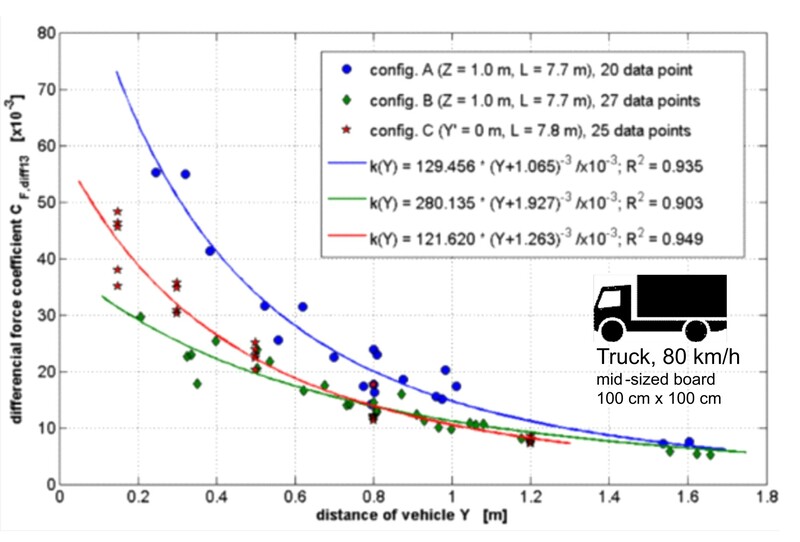 In the following Figure 2, values of differential force coefficients CF,diff13 based on force measurements with a truck are displayed. 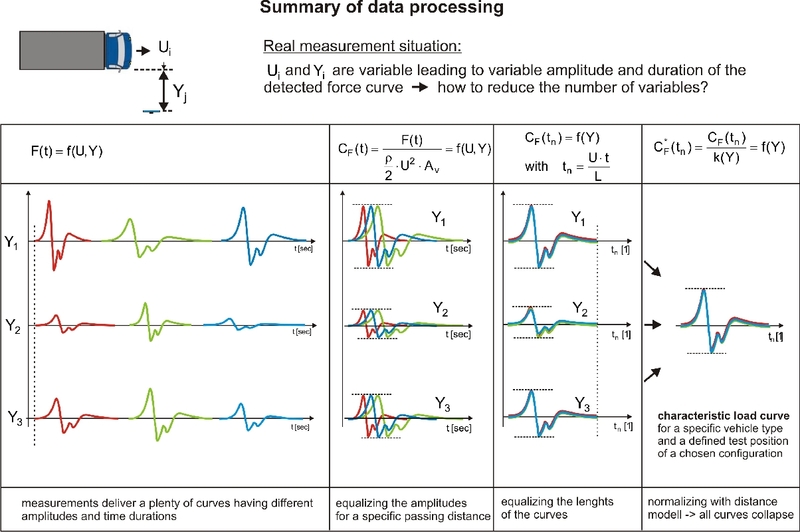 As can be seen, three distance models k(Y) for the three different configurations (A, B, C) can be derived by fitting a curve to the measurement points. The distance models (curves) increasingly differ with decreasing passing distance. For greater distances, the curves tend to zero, which means that the impact on the plate due to a passing vehicle is vanishing. As explained before, the curves of the dimensionless force coefficient CF(tn) were normalized with the distance models k(Y). Additionally, all runs of a single test position were ensemble averaged (please note again that a 'test position' is defined as a combination of one particular configuration (A, B, or C), one vehicle type, one vertical level Z of the test plate). In this way, the aforementioned characteristic load curves could be obtained for each test position, see VIPAS data below. Because the distance model was set up using the bow wave loading peaks (peak P1 and P3), a single force curve behind these peaks can more or less deviate from the characteristic load curve in dependence on the current distance. A 'test position' is defined as a combination of one particular configuration (A, B, or C), one vehicle type and one vertical level Z of the test plate. At each test position, typically, N = 15 to 25 test runs were carried out. For each run, the variable vehicle velocity U and the variable distance Y between plate and vehicle were captured automatically using laser light beam trigger and distance measuring technique. In the following tables 2-4, the main results of the fullscale experiments are given. Each box of the tables (except the last column) denotes a test position and contains two files. 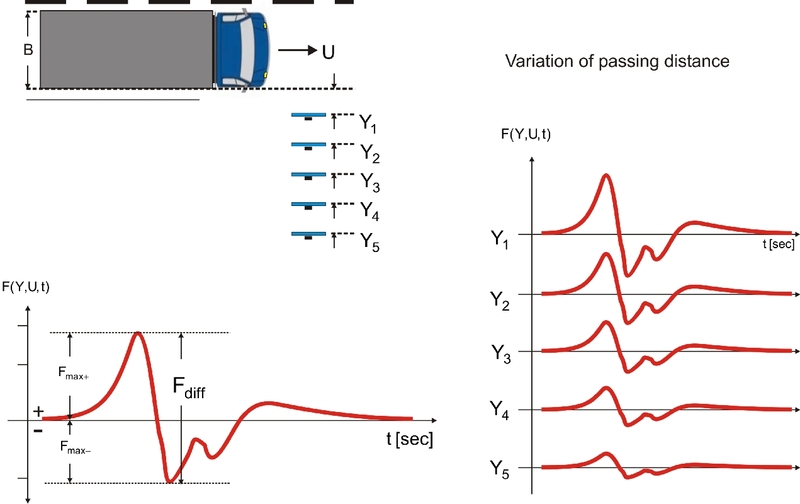 The upper one shows the characteristic load curve of the test position and the lower one shows the unsteady differential pressure distribution (difference between front- and backpressure) at the flat plate induced by the passing vehicle. 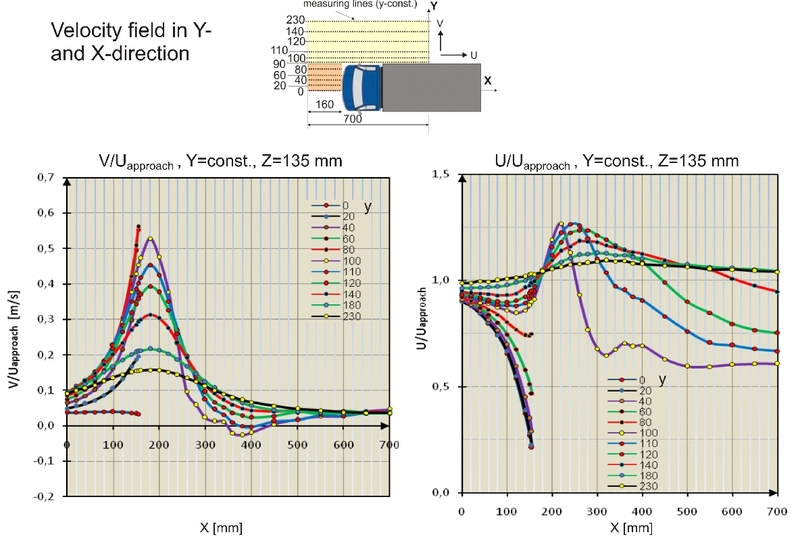 The last column gives a comparison of the induced force acting on the element for different vehicle types but with the same testing plate configuration, the same testing plate size and the same testing plate height. Substituting tn with Eq. (2) delivers the resultant force F(t) or F(X). Example 2: Which is the maximum force acting on a plate element of size 100 cm x 100 cm (medium-sized plate) with configuration A and a plate height of Z=3,0 m induced by a trailer-truck (No. 5) with velocity U=90 km/h and a passing distance of Y=0,4 m ? As a result, a maximum pressure force (away from the vehicle) of about 76 N is acting on the testing plate of size 100 cm x 100 cm. Data and images contained within this database are subject to copyright and are published for non-commercial use only. The user is not entitled to use the data commercially or publish the database or any part therof. Die Daten und Inhalte der Datenbasis VIPAS sind urheberrechtlich geschützt. Die Veröffentlichung in Form dieser Website dient ausschließlich der persönlichen Information. Eine kommerzielle Verwendung/Verwertung der in der Datenbasis enthaltenen Informationen ist nicht zulässig. Ebenso nicht zulässig ist eine Veröffentlichung oder Vervielfältigung der auf dieser Website gespeicherten Informationen durch Besucher/Nutzer. The data, text, graphics and links contained in these pages are provided for information purposes only. The authors provide no warranty, expressed or implied, as to the accuracy, reliability, or completeness of the data, text, links, and other items contained on these pages and exclude any responsibility for loss which may arise from reliance on data contained in this database. The authors may make changes to the data contained in these pages at any time without notice. The authors reserve the right to modify or withdraw, temporarily or permanently, the database (or any part thereof) without notice. Die Inhalte dieser Datenbasis wurden mit größtmöglicher Sorgfalt erstellt. 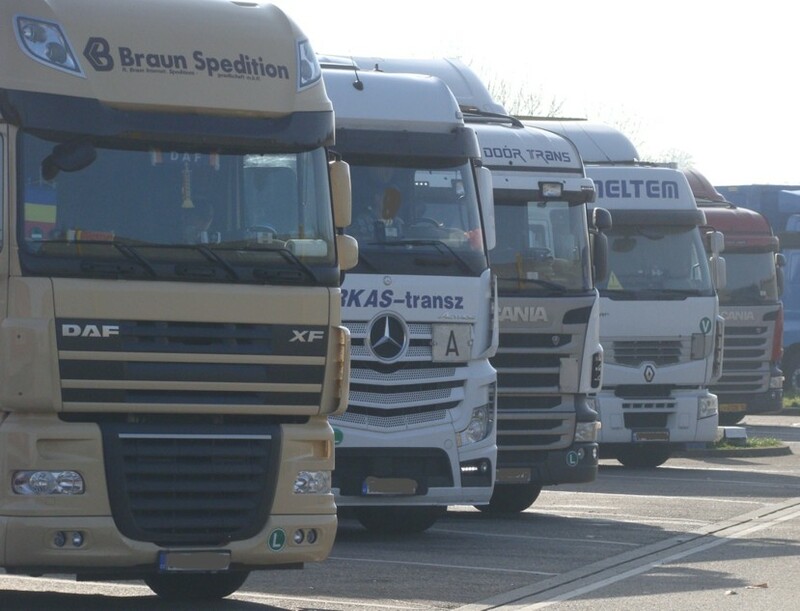 Die Autoren übernehmen jedoch keine Gewähr für die Richtigkeit und Vollständigkeit der bereitgestellten Inhalte. Die Nutzung der Inhalte der Datenbasis erfolgt auf eigene Gefahr des Nutzers. Ebenso wird keinerlei Haftung übernommen für jeglichen mittelbaren oder unmittelbaren Schaden welcher Art auch immer, der sich aus der Nutzung der Datenbank ergeben sollte. Die Autoren behalten sich vor, die Datenbank jederzeit und ohne Vorankündigung zu modifizieren oder teilweise oder gänzlich zurückzuziehen und abzuschalten.